Shale (Berenger) is a Vietnam vet and mercenary. He has a team of mercenary buddies that he does missions with – Rem (Guzman), Wellman (Brooks), the reliable Joey (Cruz), and the unhinged Hollan (Forsythe). After having gone through hell and back during numerous wars and dangerous escapades, nothing can prepare them for the most threatening and perilous mission yet – high school! 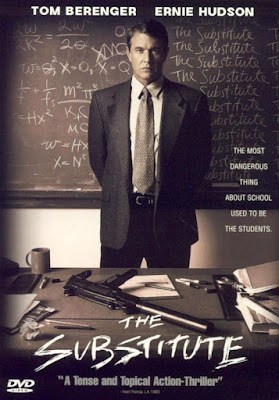 The Substitute is a movie that was a popular enough rental on VHS that it spawned three sequels to date, and in our minds remains tied to the video store era. It almost feels like cheating for us to re-watch it on DVD (never mind Blu-Ray), but it’s hard to resist the inexpensive DVD collection that compiles all four Substitute movies for one low price. It has a junkier, grainier look than we remembered from those golden days when we chose it from among the many options at our local video store. It’s also significantly longer than we remembered – at almost two hours, it’s unnecessarily lengthy. But, then again, it did play in theaters, and “theater movies” always think they have to be longer than they need to be. Needless to say, this would never make it to the theater today. 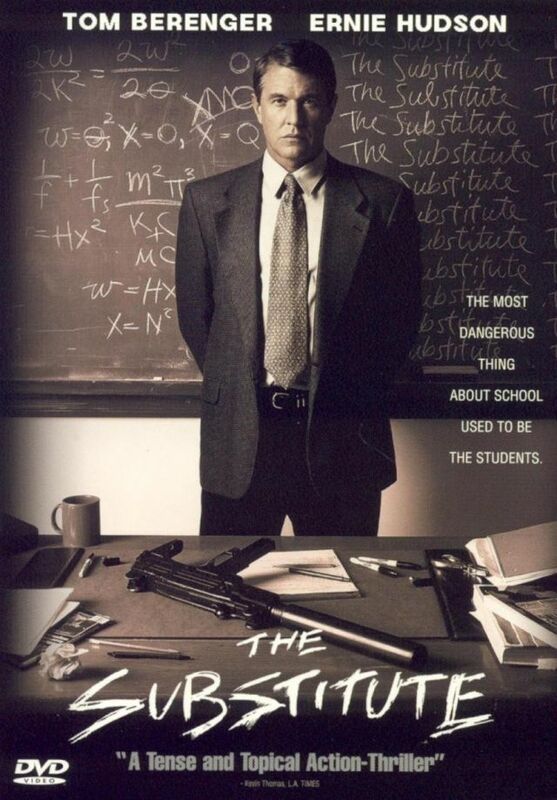 If you take all the “bad school” movies that have been with us for such a long time – everything from Blackboard Jungle (1955), to The Principal (1987), Class of 1984 (1982), Class of 1999 (1990), Dangerous Minds (1995), Detention (2003), and, of course Class of 1999 II: The Substitute (1994), not forgetting the parody of such films, High School High (1996), and amalgamate them, and add some “Mercenary Humor”, you get The Substitute. 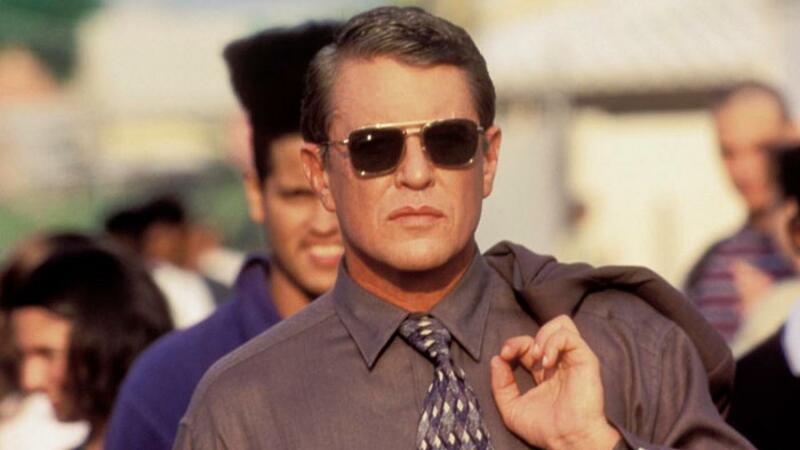 One thing the aforementioned movies don’t have, of course, are Tom Berenger’s stunning purple shorts. Or Raymond Cruz’s man bun. He was quite ahead of the current man bun trend. We think that’s what The Substitute will really be remembered for. Sure, there’s a lot of silly dialogue, a couple of brain-numbing action scenes, and your typical 35-year-old teenagers, and that’s all well and good, but sadly there’s some bathroom humor, mostly typified by the character of Wolfson (De Young). Just why an overlong movie felt it had the time to include bathroom-humor scenes remains a frustrating question. That aside, the library scene is a winner, even though you have to wait almost an hour to get there. The presence of Marc Anthony as Lacas makes you understand why J. Lo fell so madly in love with him. One thing you have to give The Substitute is that the cast is really strong, with plenty of names/faces we all know and love. Although, not to be mean, Berenger looks a little chunky to be a mercenary in fighting-fit shape. Maybe that’s why he didn’t return for the sequels and the great Treat Williams took his place. Or perhaps we should say substituted for him. Sorry about that, but I guess we have substitutions on the brain, as this movie teaches us that the practice of substituting solves all of life’s problems. Finally, special mention should go out to one Willis Sparks as the character of John Janus. He was a competing mercenary who even had a truly awesome “mercenary demo reel”, which was unquestionably a movie highlight. (It ought to be; Janus informed us that it was created by a guy who normally does “rock videos”). Janus’s demo reel should have been this movie. Or it at least should have spun off into a movie of its own. It would have done in the 80’s, but by this point we were firmly entrenched in the 90’s, so, consequently there was no John Janus spinoff movie. Too bad. 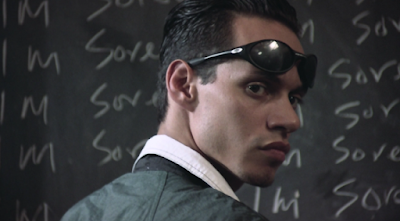 At this point in our nation’s history, The Substitute has attained “Video Store Classic” status, so anyone who remembers it from that time will appreciate it still, but to be honest it’s not without some significant flaws. In other words, it’s no Substitute 3: Winner Takes All (1999), that much we can tell you. Stellar work as always. Of every movie review site I peruse, this one ALWAYS sets the bar high. With well-written reviews and regular updates, this site is must-read, time and time again. Having said that, I would argue that the 2.5-star rating you gave this flick was a little light, considering it spawned three sequels. True, I agree that Treat Williams was a better lead than Berenger, but he at least got the ball rolling. And your "substitute" jokes were incredible! 2 and half stars !!!?? Are you kidding me ? This movie is fantastic ! Joe: We're really glad you found us after the .com to .net change. Thanks for your kind words. We would love to teach a college course on action! Other ideas: Advanced Dolph Lundgren, or Ron Marchini Studies. Anonymous: Maybe we were a little tough with the rating, (keep in mind it's 2.5 out of 4 not 5), the movie is not without it's flaws. We highlighted all the positives too.